Kayla Bonilla (3) drives to the basket for a lay up. She finished the game with 11 points. 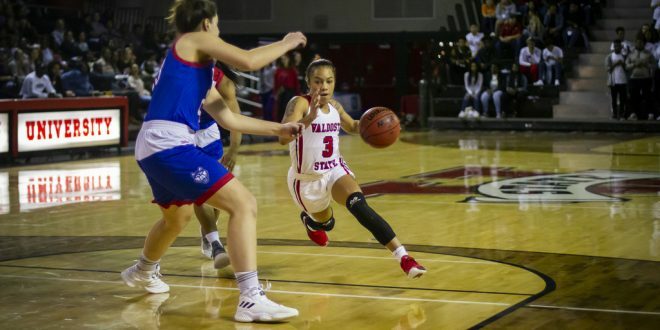 Following a slow start, the Lady Blazers fell to the West Georgia Lady Wolves 70-65 on Thursday night, after a late rally in the fourth. Neither team could put together a run in the first five minutes of play as both were held to five points each. The first half ultimately started rough for VSU, but they managed to lead 31-29 going into the half. Following the intermission, things began to get out of hand as the Lady Wolves forced eight turnovers. They also suffocated the perimeter, allowing only three three-pointers in the second half alone—the worst the Lady Blazers have shot from all season in the second half. It was a revolving door for UWG, as they continued to get fouled by VSU. The Lady Wolves drained 15 total free-throws in the second half. By then, the clock was not in the Lady Blazer’s favor. Senior Maddy Corazza led the way for VSU in the scoring department tallying 18 points. She was an early favorite for VSU fans as her name was chanted every time she touched the ball. Wolves’ Aysha Harris couldn’t be stopped from getting into the midrange and the foul line. She led all scorers with 26. Assistant Coach Chandler Merkerson emphasized the team’s inconsistency play throughout the game epically in key moments down the stretch. When VSU started to figure things out late in the second and go on a run and it seemed to fuel them come back after halftime after a pep talk from the coaching staff. “We spoke about picking up our defense and having more impact on the ball some of our game plan was to give them some the shots that they took kudos to them for stepping up and making those shots,” Merkerson said. Sophomore guard Kayla Bonilla gave praise to her teammates’ willingness to play through the whistle even in a losing effort. “Hustle was our best aspect, we continued to play through the buzzer our team made plays and really big shots at the end, “Bonilla said. Heading into next game, the focus will be preached to go out and getting a win in the next bout. Written by Cecil Merkerson, Staff Writer. Photo courtesy of VSU Athletics.